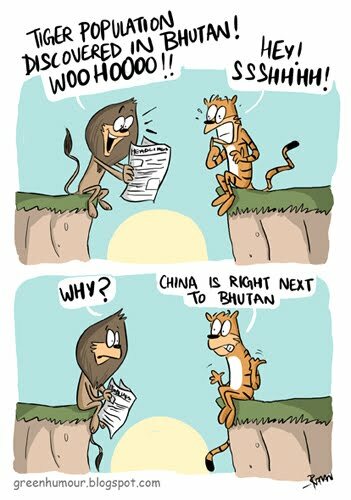 Green Humour: Good News from Bhutan! 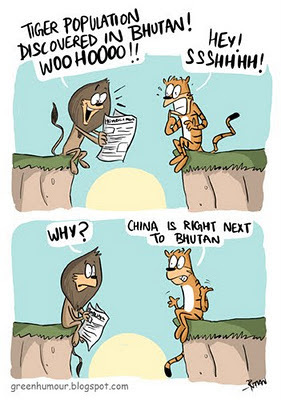 A BBC film crew recently captured footage of tigers in Bhutan. The discovery has surprised scientists and wildlife enthusiasts alike as these could be the highest living tigers known. This also signifies a sort of a connect between the fragmented populations of tigers across Asia and is likely to play a crucial role in tiger conservation in the years to come. If only it can be kept safe from China's wrath!